An exhibition space has closed its doors in order to be transformed into the new home of the National Football Museum. Manchester's Urbis welcomed its final visitors on Saturday before it reopens as the football museum in summer 2011. Controversial plans for the museum to leave Preston North End's Deepdale stadium were revealed in October. About half the workforce, 66 jobs, have gone with the venue's closure. But new jobs will be created for the reopening. About seven staff are staying at Urbis as a "transition team" which will help develop the new museum. Preston City Council opposed the move, but the museum has said it hoped to keep a "public face" in the city if funding could be secured. The museum has a 34,000-item collection, which includes the ball from the 1966 World Cup final and the oldest FA Cup trophy. 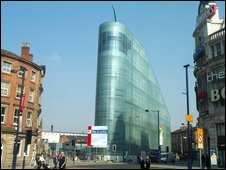 Urbis opened in 2002 as "an exhibition centre about city life" during the transformation of the Exchange Square area. Football Museum: what would you add?